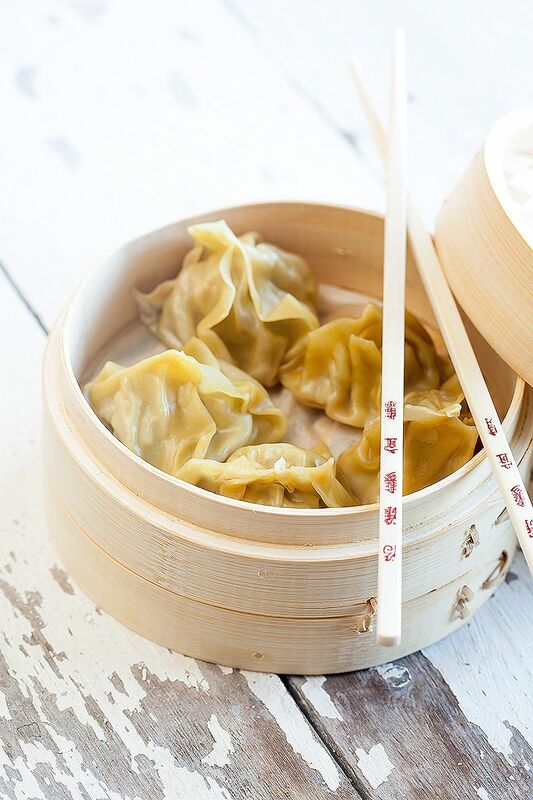 Steamed dumplings are very easy, with almost no effort you can create your Chinese restaurant favorite appetizer at home. Ready in 30 minutes. Finely chop the garlic cloves, bamboo shoots and jalapeño pepper. Slice the spring onion in thin rings and chop the coriander leaves. 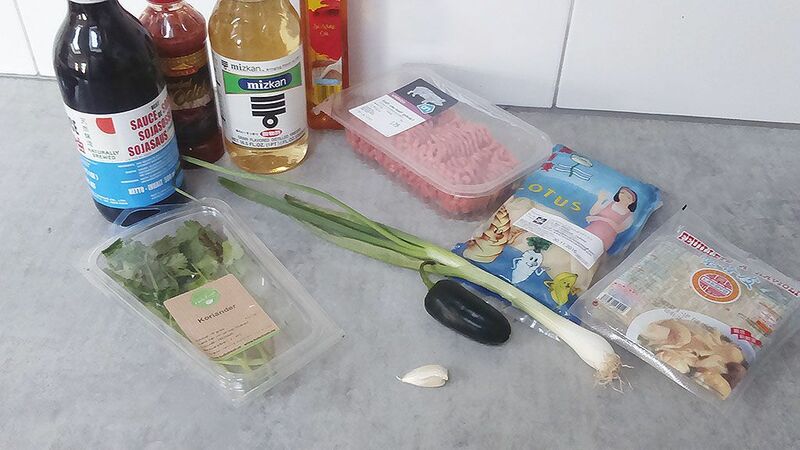 Combine the garlic, bamboo, jalapeño, spring onion, coriander, 1 tablespoon mirin and minced meat in the small bowl. Season with pepper and salt. Place one tablespoon of the mixture in the middle of a wonton wrapper. Brush the sides with a little bit of water and fold it inwards to close the wonton wrapper. Press a little to make sure the dumpling is really closed. Repeat this step for all of the dumplings. Add a layer of water to a pan and bring to a boil. Set the steamer basket on top and add the dumplings, make sure the dumplings won’t touch each other. 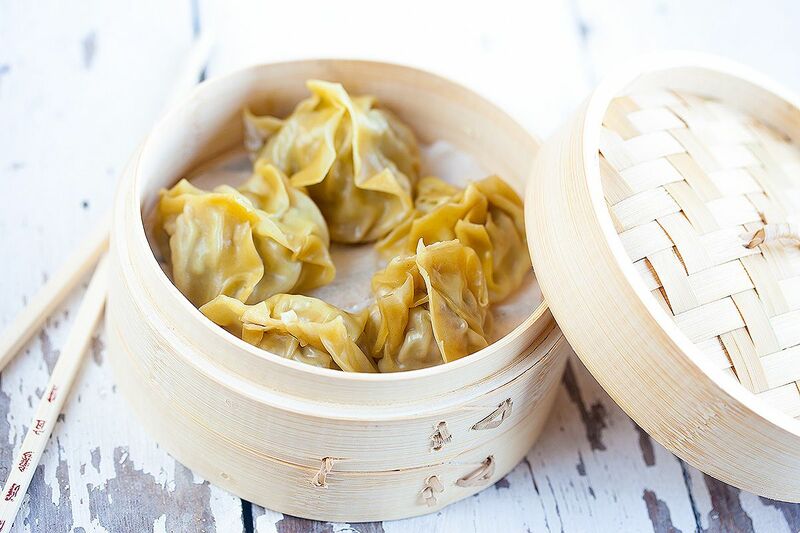 Don’t overcrowd the basket, if the basket is too small, steam the dumplings in batches. If you have multiple baskets, you can stack them on top of each other and then only close the top basket. Close the basket and steam the dumplings about 15 to 20 minutes. 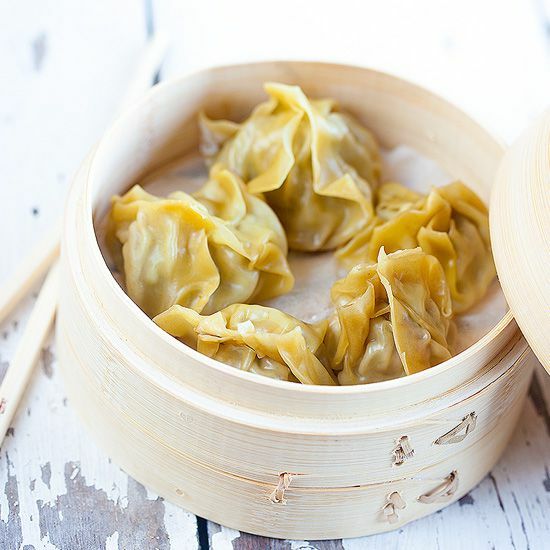 Dumplings will go great with an easy dipping sauce. Combine soy sauce, sambal, the leftover tablespoon mirin and sesame oil. So now get your chopsticks and start dipping, enjoy! I love steamed & pan fried dumplings. Have never used jalapeno in mixture; will certainly give it a go very soon.